The grapes for this wine were grown on the stony loam soils of the Hope Plains. Cool nights, combined with New Zealand’s highest sunshine hours, provided us with the ultimate growing conditions needed to make great Sauvignon Blanc. The Sauvignon Blanc vines on our home vineyard are now 20 years old and contribute wonderful concentration and structure to the wine. Meanwhile the Sauvignon grapes grown on the nearby Sturkenboom and Chisnall vineyards provide exciting arrays of intense aromas and flavours. Each block was harvested individually at its optimum level of ripeness. In the winery the grapes were handled very gently and underwent cool fermentations in stainless steel tanks using selected yeast strains. Each component was then held separately and matured for six weeks on yeast lees to allow the fruit characters to fully integrate. 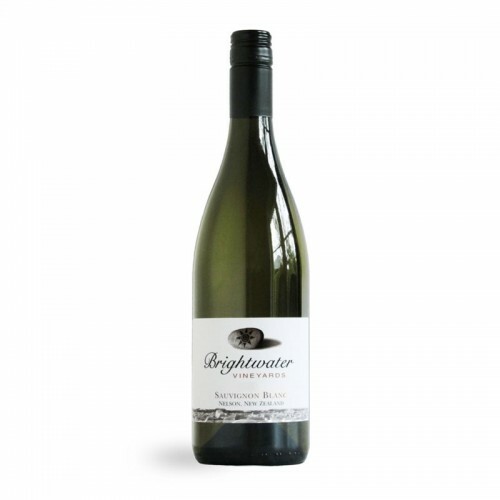 Then, after careful blending trials, selected tanks were combined to make the Brightwater Vineyards Sauvignon Blanc. Brightwater Vineyards is the premium boutique vineyard and winery of Gary and Valley Neale. Established in the early nineties, we have developed an award winning reputation for premium, hand-crafted wines. We are best known for our highly awarded Chardonnays, Rieslings and Sauvignon Blancs we are also considered leading producers of Pinot Noir and Pinot Gris. of our modern winery. We utilize a minimal intervention approach allowing the true expression of the vineyards to show and make distinctive wines that display true fruit character, elegance and fine balance. In 2012 Brightwater Vineyards was named as “New Zealand Winemaker of the Year” and also “Nelson Supreme Business of the Year.” Our success comes down to the passion and committment of our wonderful team, led by Tony and Dale. Sustainable and responsible production is at the heart of our business, and we are proud to be part of SWNZ. All our currently available releases are available for purchase online. You can pay for your order securely using our payment partner PayPal.com or via Internet Banking. We offer free shipping throughout New Zealand, and we have very competitive rates on international shipping too. Take advantage of up to 15% discount on your order and join one of our wine clubs. You'll never miss a new release, and you'll always get a great deal. Copyright Brightwater Vineyards 2019. All rights reserved.